QLC SATA SSDs haven't quite hit the consumer market just yet, so the most affordable entry-level SSDs are still DRAMless designs with TLC NAND. The Mushkin Source is a current-generation example that provides only modest improvements over older DRAMless SSDs, but is adequate for most home systems. The Mushkin Source is an entry-level SSD designed to offer the absolute lowest cost possible from current-generation components. The 500GB drive we're testing today is currently for sale at $65, putting the price per GB at a very low $0.13. Specifications for our drive look pretty standard for a drive in this price range: peak sequential read speeds of 560 MB/s, writes at 520 MB/s, and 75k/81k IOPs respectively. Mushkin rates the drive at 2 W active and 80 mW idle, and with a three-year warranty that is typical for entry-level SSDs. The write endurance ratings are pretty low - for this 500GB drive that is 200TB total writes, which equates to a paltry 0.22 drive writes per day over those three years, equivalent to about 0.13 DWPD over five years (our usual metric). That endurance value is almost as low as what we're seeing from SSDs that use QLC NAND, and is likely due to a combination of the DRAMless controller making it harder to keep write amplification low, and Mushkin potentially using somewhat lower-grade flash in the Source. Nevertheless, the aim of this drive is primarily cost, and is aimed at a home user unlikely to do 100GB of writes per day every day. SATA SSDs with four-bit-per-cell QLC NAND flash memory are coming, but are not yet available in the consumer market and yield issues are preventing QLC from yet offering a meaningful discount relative to TLC NAND. That has led Mushkin to use a more familiar formula for the Source: 3D TLC NAND combined with a DRAMless SSD controller. Drives in this market segment always make sacrifices to reach the lowest price points, but they don't all make the same tradeoffs. NAND flash memory prices have been in steep decline in recent months, and Mushkin has for the most part been able to keep pace with price drops for the Source. There have been occasions where more mainstream SATA drives with DRAM caches have gone on sale for lower prices than DRAMless drives, but the Mushkin Source has usually been quite close to being the cheapest SSD on the market from a reputable brand. Almost any SSD can garner some measure of success simply by being the cheapest. Being the cheapest *and* offering better than bottom-of-the-barrel specifications is harder to pull off. The Mushkin Source uses Silicon Motion's SM2258XT controller, the DRAMless variant of the familiar SM2258. There is a newer SM2259 SATA controller but it doesn't offer any significant benefits for consumer SSDs, so the 2258XT can still be regarded as the current-generation solution from Silicon Motion. The Source uses Micron 64-layer 3D TLC NAND, which has proven to be much faster than their previous 32-layer 3D NAND and has been used in great products in all segments of the SSD market. With only four NAND channels coming off the small SM2258XT controller and no external DRAM packages, the PCB inside the Mushkin Source is quite compact. Unusually, the SATA connector is not a discrete component attached to the edge of the circuit board but instead is formed from a combination of exposed contacts on the PCB itself and a plastic part to fill out the rest of the connector's shape. This may not be as durable as a discrete connector and certainly doesn't look as neat, but it works fine and probably saves a few cents. There's a token thermal pad between two of the NAND flash packages and the case, but is seems unlikely to have much effect on the drive's operation. Mainstream SATA SSD product lines seldom offer a 120/128GB option these days due to the lower performance such small drives suffer from with only four NAND flash chips to work with. 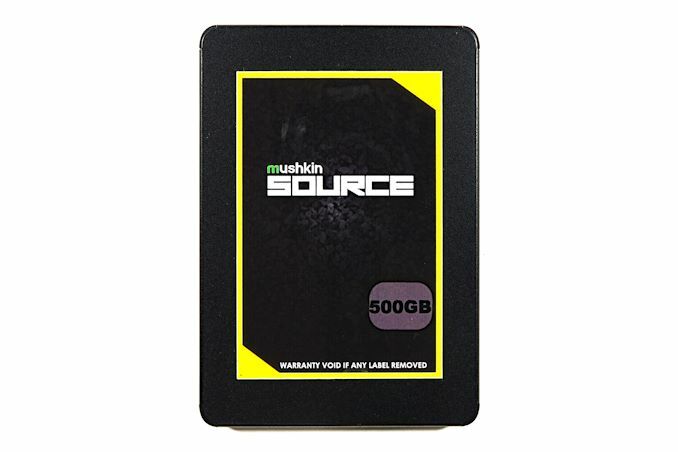 For entry-level products like the Mushkin Source, 120GB options are still relatively common even though they carry a significantly higher price per GB than 240GB and larger drives. As can be expected, the specifications for the smallest Mushkin Source reflect this lower performance, and the 250GB model improves on it but is still not up to full speed for things like random read throughput. The primary competition for the Mushkin Source is other dirt-cheap SATA SSDs. Most of these are also DRAMless SSDs, usually based on Silicon Motion or Phison reference designs and sold by numerous brands. We have the Toshiba TR200 standing in for the Phison-based drives - availability of the TR200 has been inconsistent and pricing has often been far too high, but its performance is representative of cheaper products that use the same Phison S11 DRAMless controller with Toshiba 64L 3D TLC. The other DRAMless SSD in this review is the HP S700, which uses the same SM2258XT controller but older 32-layer Micron 3D TLC NAND. It's also fair to compare the Source against mainstream SATA SSDs with DRAM caches, because the best deals in that market segment are usually within a few dollars of the going rate for DRAMless SSDs, and the more popular and thus higher-volume mainstream products occasionally end up undercutting DRAMless drives on price. SSD prices are so compressed right now that I'm considering getting a Samsung 860 EVO... as the 'cheap' option.